On the Norwegian mainland, their numbers have fallen so sharply that they are reared in captive breeding programmes and released into the wild again. On Spitsbergen, on the other hand, their population is stable. And this despite the fact that the curious Arctic foxes were intensively hunted because of their fur for centuries. Description: Adult Arctic foxes are about 60 cm long and 2.5- 5 kg in weight. They have a very dense, thick, usually completely white winter fur, that is brown during the summer; moulting is from May to early July and September to December. Additionally, there is a small proportion that remains dark brown throughout the year. 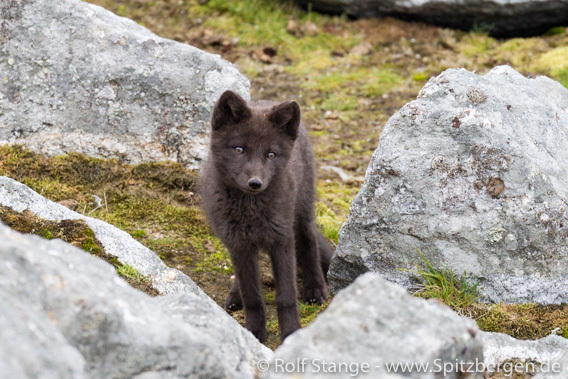 These types belong to the same species, but it is the dark morph, the so-called “blue fox”, which is very rare in Spitsbergen, about 3 % of the total population. »Blue fox« with dark fur all year round. Distribution / Migrations: Arctic foxes have a circumpolar distribution. They roam over large areas, preventing sub-populations from being isolated. 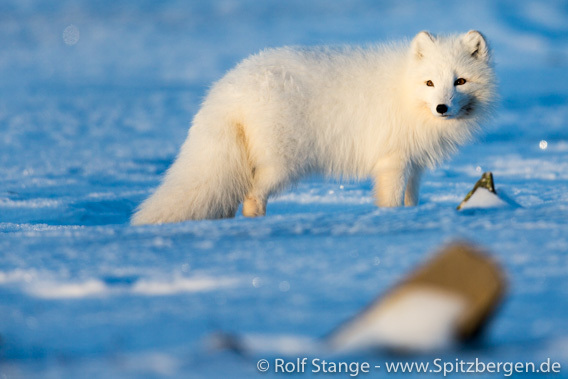 In Svalbard, Arctic foxes appear on all the islands and in all habitats from the drift ice at sea to mountains, although they prefer the tundra in the vicinity of bird cliffs during the summer. In favourable areas with good food availability an Arctic fox may manage with a territory of less than 10 sq km, otherwise 10-20 sq km. Biology: Arctic foxes eat pretty much everything they can get hold of, typically eggs and chicks during the summer. 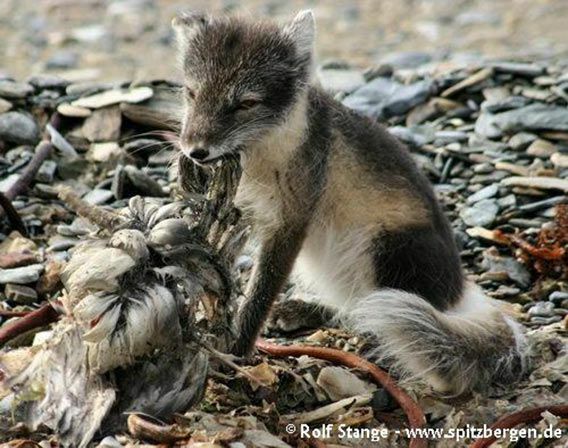 They have to make do without rodents in Svalbard, as these do not occur in this region. Food availability during the summer is generally good, but the winter is a meagre season, during which Ptarmigans, carrion, hidden stocks and, near settlements, rubbish are important items on the menu. Some Arctic foxes follow Polar bears out onto the drift ice and feed on the left-overs of their meals. Starvation during the winter seems to be the main cause of death. During the mating season, Arctic foxes have a territory, the size of which depends on food availability: The more food that is available, the smaller the territory. Mating is in March, and the female will give birth in a den, often under large rocks, in late May or early June. Five or six cubs, even more in good years, are born to enjoy the rich, early arctic summer, but many will die during the first winter. Those who survive have a good chance to reach an age of three or four or, in exceptional cases, even ten years or more. Miscellaneous: The population is sound and stable in Svalbard despite centuries of intense hunting. Outside the protected areas, locals are still allowed to hunt during a certain period in the winter. Arctic foxes have traditionally been caught during the winter with wooden traps that kill the fox with a heavy weight of stones without damaging the precious fur which provided a very important income for trappers. Nevertheless, Arctic foxes are often quite inquisitive and with a bit of luck you may observe them from a close distance. Remember, however, that they can have rabies or tapeworms in Svalbard. Both can be very dangerous for humans, so don’t touch unnaturally friendly or dead foxes or fox excrement. »White fox« with white winterfur.